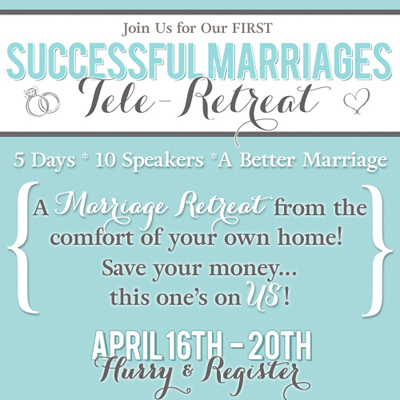 Those amazing women at The Dating Divas have put together a one-of-a kind debut event to strengthen marriages — The Dating Divas “Successful Marriages” Tele-Retreat! Best of all — it’s FREE! — and you can participate right from the comfort of your own HOME. Register today by clicking here! You’ll find all kinds of great information and see all the fabulous presenters and their fun tele-seminar topics. Over 1000 participants have already registered so don’t delay! Click here for the tele-seminar presentation slides! I had the opportunity to sit in on this “tele retreat” early this year and found that it featured a lot of wonderful insights on working on and committing to living in a happy marriage. And best of all, the information was offered for free! I particularly liked the portion on spicing up our marriage. My husband and I tried several new things and I’m glad to say our marriage has never felt stronger. It’s like we’re newlyweds again. I haven’t had a chance to catch Laura’s television show, but I have picked up a copy of her book. I’ve read it twice now and have marked it up tremendously. I hope you present a similar retreat sometime next year. This was such a great help and has made my husband and I a happier couple.